Hydrofluoric acid and its salts are used at several stages in the processing of many metals, in industries such as primary aluminium manufacture, stainless steel, and foundries. HF is used to separate essential metals from mineral ores. Tantalum and niobium for example are used in electronics and other important applications. Tantalum is essential in the production of mobile phones. 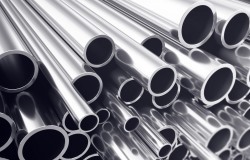 Aluminium is obtained from bauxite (Al2O3 ·2H2O) by electrolysis. The electrolyte used is sodium aluminium fluoride, known as sodium cryolite. The other principal raw material in this process is aluminium fluoride (AlF3). AlF3 serves as a melting point reducer which leads to significant energy savings. Another example of the importance of fluorine is in metal surface treatment. Hydrofluoric acid is used, together with nitric acid, in the manufacture of stainless steel to remove unwanted oxides and other impurities from the surface of the finished metal sheet.